Well, if you want to be really picky about it, a solar flare can't hit the Earth. It's an eruption on the surface of the sun. 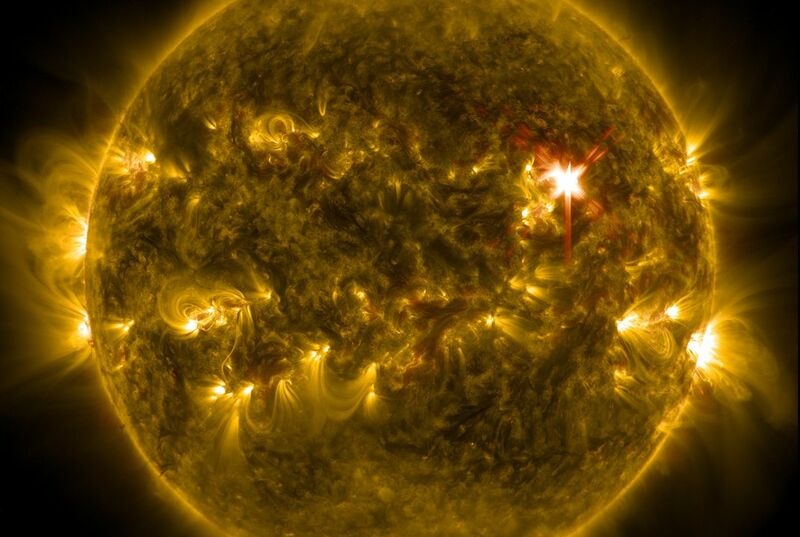 But a big flare can send a solar super storm hurtling towards Earth, blasting us back into the days before electricity. Fast forward to today, where we're so completely dependent on technology that things can get really ugly. A storm as powerful as the 1859 version will probably fry a lot of satellites and our electrical grid. So millions of people could be without light, water, fuel, sewage treatment, perishable food and meds for months. I think that a solar flare would cause some disaster if a solar super storm hit the earth. It could take electricity away and that would be bad because we use electricity everyday. I don't think that there is that much of a chance that a solar flare would hit the Earth. Our way of living has developed a lot from long time ago and we use electricity a lot so it would be chaos if a solar flare hit the earth. The author means that our time continuum would be fast forward and altered the present (We would be transported though time to the future). When the author says "fast forward to today?" he means when he was talking about 1859 as if was present day. I think that this might be very bad for us because a solar flare is going to destroy ever technology that we have today in our world. We are very dependent on technology which we are not prepared for the solar flare. I think that a solar flare would cause some disaster if a solar super storm hits the earth. It could take electricity away and that would be bad because we use electricity everyday. I don't think that there is that much of a chance that a solar flare would hit the earth. Our way of living has developed a lot from long time ago and we use electricity a lot so it would be chaos if a solar flare hit the earth.